An old friend of King Mickey, Queen Minnie, and the other folks at Disney Castle. Clarabelle is also close friends with Horace Horsecollar. She loves any kind of gossip. Clarabelle Cow is a civilian living on the Timeless River in Kingdom Hearts II. She is one of the citizens working on the building of Disney Castle. She was not aware of the Heartless's attack, and was dumbfounded by the appearance of the Windows of Time and Pete chasing Pete. She is likely still alive somewhere in Disney Castle or in Disney Town, although she is never encountered during any other point the storyline. 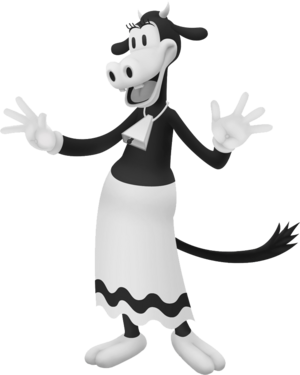 Clarabelle Cow is, as her name suggests, an anthropomorphized cow with black skin, white, hooved feet, a white mouth, and two small, white horns on the top of her head. Her eyes are large and close-set, and she only has two flat teeth visible in her upper jaw, somewhat like Goofy. She has long eyelashes and long, floppy ears. She only has four fingers on each hand, and wears white gloves common to many older Disney characters. She also has a long, black tail that is ruffled slightly at the tip. Clarabelle wears a long, white skirt with a black, undulating pattern near the bottom. She also wears a white cow bell around her neck. From her Disney cartoons and journal entries, Clarabelle is described as being very gossipy and very talkative. She also is best friends with Horace Horsecollar. In the Disney cartoons, Clarabelle is sometimes paired up with Goofy the way Daisy is paired up with Donald. She is also shown to enjoy long walks. Clarabelle first appeared as a farm cow named Carolyn Cow in the 1928 Disney cartoon Plane Crazy. She appeared as Carolyn in a few more Disney Cartoons until the 1930 cartoon short "The Shindig" in which she was changed into an anthropomorphized being named Clarabelle Cow. Clarabelle was the best friend of Minnie Mouse and was usually depicted as the girlfriend of Horace Horsecollar, although she was occasionally paired with Goofy. This page was last edited on 12 February 2019, at 13:32.